Royal Denship and designer, Bill Dixon, chose Q-SPD surface drives for their compact and lightweight installation compared to other surface drive solutions. Q-SPD modular design means waterline length is not compromised and excessively long boarding platforms are not needed. Performance at all speeds is fantastic as well as quiet and smooth. Ramco Boats and the vessels owner chose the Q-SPD surface drive for this quintessential 35ft aluminium Kiwi family weekend pleasure boat, designed with the average recreational fisherman in mind, she boasts some features you would expect on a much larger vessel and performance to burn. The Cobra 48’ was designed as a prototype high speed boat for offer for both pleasure boat customers and to government authorities in the middle east. 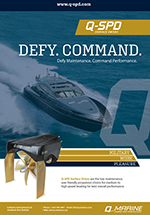 Q-SPD SD200-F drives are driven by Seatek 820hp engines producing exceptional acceleration and speed. Q-SPD drives were chosen for performance, reliability, low maintenance and ease of use. The results speak for themselves. This boat hops on the plane within 14 seconds and accelerates to full speed effortlessly. Low cruise planing is maintained at 23knots at full load and speed loss from light to heavy load is only 3 knots.